Personally, I adore contouring. It took me a while to get the hang of it and I know that the traditional style of contouring Kim K style doesn't work as well for my personal face shape, so I've tailored my contouring routine to compliment my own face and shape. I have a lot of contour products, after going on a bit of a mission to find that absolute holy grail product or kit which I couldn't live without. When I'm going all out, I use my MAC Pro-Sculpting Creams, by far my favourites for contouring and highlighting, getting that perfect definition - but as cream products, they can take a lot more time and effort than other kits in my beauty stash, and are usually kept for nights out or special events. For everyday wear I am more than happy to turn to powder products and kits. They do the job just fine, are quick and easy to use and overall, fuss-free in comparison to cream products. I've shared quite a few high-end contour favourites over the past few months, including a post on my Top Contour Products featuring both contour kits and bronzers with the right tone which makes them great for contouring. I've also shared my love for the Smashbox Step by Step Contour Kit, which I think is a fabulous and handy little kit, as well as my personal favourite and absolute must-have, the Daniel Sandler Sculpt and Slim-Effect Contour Face Powder, which for me is just absolutely heavenly and still leaves me swooning every time I use it. But, all of these products have one thing in common - they're high-end. What about the high-street and it's ever-growing selection of contour products and kits? 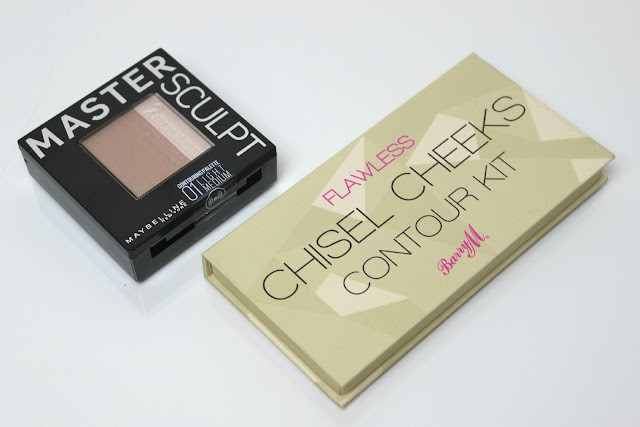 The Barry M Chisel Cheeks Contour Kit was on my radar for months. Not only did lots of you lovely readers recommend I check it out when I've reviewed other contour products and kits, but I've seen this little kit absolutely raved about on blogs and YouTube ever since it's release. It only took me so long to pick it up and add it to my beauty stash, because it was constantly sold out! Goes to show just how popular this budget-friendly kit is. Presented in a cardboard palette, much like the Barry M eyeshadow palettes, it is extremely lightweight and houses 3 individual shades at 2.5g each. There's a Light Powder, Medium Powder and Dark Powder. The light shade is for highlighting; perfect for under your eyes to brighten them up, down the center of your nose, cupids bow, center of your forehead and the tops of your cheekbones. It's completely matte, very soft in tone and doesn't look too stark against skin, so a pretty good highlight shade for the kit. The dark shade is advised by Barry M to be used as the final step, but personally I prefer to contour before bronzing and as it's the shade Barry M have included for contouring, I like to use this after the lightest shade. Another matte shade, it's a deep brown which I like, but doesn't have the taupe tone I look for in contour shades. Still a very easy shade to work with though and is great for adding definition to your cheeks, jawline and along the sides of your nose. 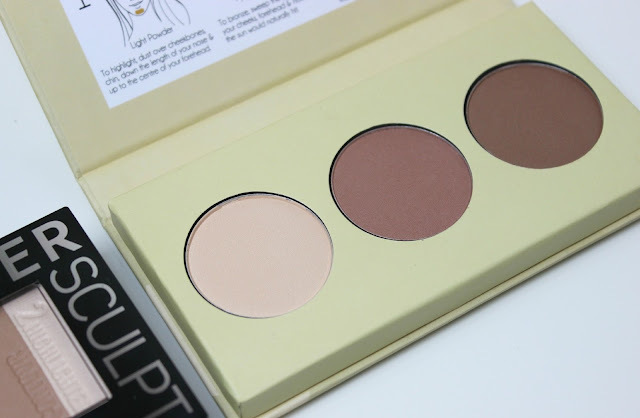 The medium shade, which is the middle shade in the palette, is for bronzing. Again a matte shade, this one is actually quite fair in comparison to the contour shade and would work well against a variety of complexions for warming up the skin and creating a nice, subtle glow. Available at Boots for £6.49, it's pretty decently priced for what it is - I don't think the shades are the most flattering to work with, but the formula is soft and easy to apply and blend; for a high-street kit it's a great alternative to the more costly Smashbox contour kit. A new release which has just hit the beauty shelves, and available in two shade formats, is the Maybelline Master Sculpt*, a kit which is laid out in a similar way to my Daniel Sandler favourite, with two products housed in one compact pan. It's available in Light/Medium and Medium/Dark - I've been trying out Light/Medium, which is just a touch too pale against my complexion, so if you've got a similar skin tone to me or darker, I'd opt for Medium/Dark. The packaging for this one is a bit more swish than Barry M - a plastic compact that has two sections; when you first open it you're met with the product itself; the contour shade is much bigger than the highlight shade, but this makes sense as you're more likely to use the contour shade more than the highlight. Hidden underneath the product is another little compartment, with a fabulously handy and pretty big mirror with a little travel brush for application. The highlight shade is lovely. Unlike the matte highlight in the Barry M kit, it has the tiniest hint of a frost finish, very subtle so no glitter overload, but enough to catch the light in all the right places. The contour shade is incredibly subtle - unfortunately against my complexion the Light/Medium contour shade doesn't show at all, but upon swatching on the palest part of my body I could find, it is a lovely subtle warming contour which could also very easily be used as an all over warming bronze for you pale beauties. I've swatched the Medium/Dark version in-store, and will definitely pick it up as that shade is much better for my complexion, and the highlight shade has really won me over. Available at Boots for £6.99, it's also a very budget-friendly option if you're on the lookout for a high-street contour kit. The formula of the powders is lovely; velvety soft, easy to apply and blend (from using the highlight shade regularly), I also think the brush included is a fab addition! Have you found the perfect budget-friendly contour kit yet? Or are you tempted to give one of these a try? The drugstore can get it so wrong when it comes to contour. I personally love Sleek's kit! I'm really enjoying the maybelline kit so far, I love that it comes with a little brush and a mirror too, it's just so handy, I have the darker shade and it's lovely. I haven't tried either, personally i prefer cream contour, but i may have to give the Barry M kit a go! I've been a bit disappointed with my Maybelline Master Sculpt! 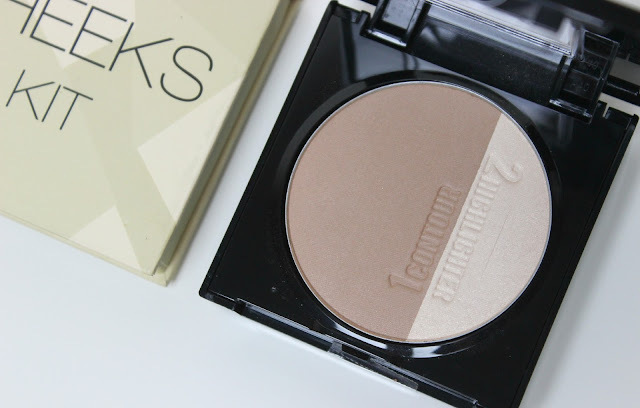 Soap and Glory Solar Powder is my favourite product to contour with! I’ve just hit pan on my Charlotte Tilbury Filmstar Bronze & Glow and definitely need to pick up something that is on the cheaper side of the contour scale! I recently picked up the Barry M one and I'm already obsessed with it, I'll definitely have to try the other one though! I've recently picked up the Maybelline kit and I can't wait to try it out! The Barry M one looks really good too!